VACATION BIBLE SCHOOL is a week-long adventure for kids from age 4 entering pre-school through entering 4th grade. Each year's theme is brand new, fun, and exciting with meaningful messages, memorable stories, and adventures where kids can grow closer to God. Summer 2019 Roar, Life is wild. God is good! Give kids a reason to ROAR in 2019! Here's how: Kids discover that God is good through all of life's challenges. Life is wild for kids--full of ups and downs and twists and turns..It can often feel chaotic and out of control. 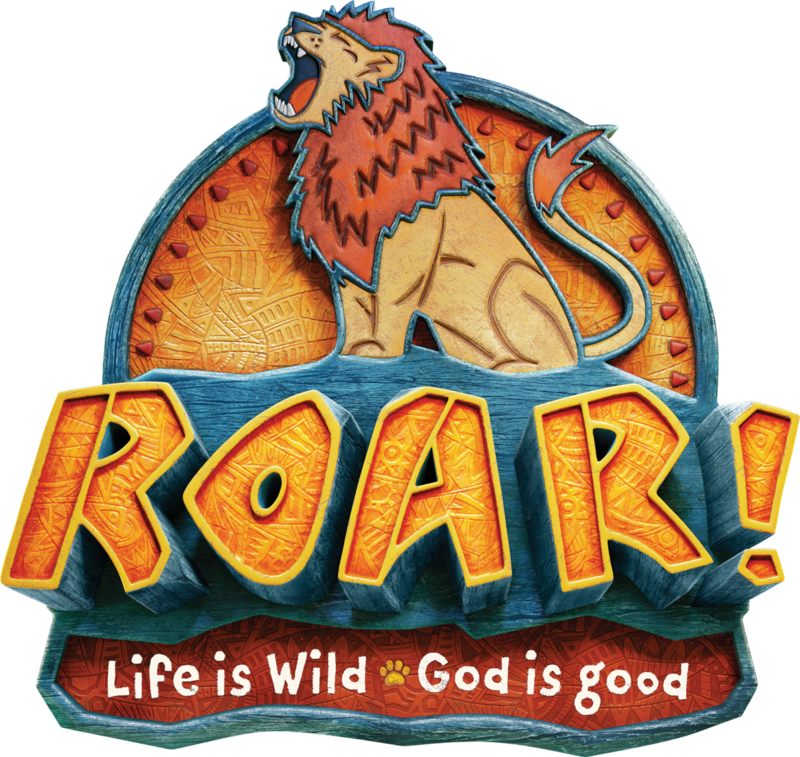 At Roar kids experience the solid foundation of God's goodness--something they can stand on, cling to, hold, and remember when the wild side of life doesn't feel so fun or adventurous. Kids will deepen their friendship with a mighty, loving, and good God who empowers them to boldly face life's challenges. (Since everything is hands-on, kids might get a little messy. Be sure to send them in play clothes and safe shoes.) Plus, we’ll help kids discover how to see evidence of God in everyday life—something we call God Sightings. Get ready to hear that phrase a lot! The program is available for children age 4 entering pre-school to entering 4th grade in the fall of 2019. The cost is $25/1child, $40/2 children and $55 max per family. Checks can be made payable to St. Veronica Parish. T-shirts will be distributed after Mass the weekend prior to VBS. Please also consider giving your time and talent for this wonderful week by filling out the online volunteer form – The experience cannot happen without the help of many, many volunteers. If you are over 18 years of age or out of High School, Volunteers must be Virtus Trained. I invite everyone to consider being part of VBS. Whatever you do, it will be ferocious! You may pay by cash or check (payable to St. Veronica Parish) or online payment by clicking above. All cash or check payments can be sent to Theresa Kearney in the REP Office. This form is required for all children participants and volunteers under the age of 18. June 8 - Registration deadline - NO REGISTRATIONS ACCEPTED AFTER JUNE 8th. Thursday July 11 - VBS Decoration Night 6-8pm - please come help us create!! July 13,14 - T-shirts will be distributed after all masses. Sunday July 14 - VBS Final Decoration Day - please come help us put the finishing touches on VBS decorations. Friday July 19 - VBS Finale and Last Day Party - join us at 12:00pm for the VBS Finale. Stay after to celebrate a fun-filled and successful week with lunch and community.